What if you could roll out of bed and complete a whole day in your PJ’s…without looking daft? If you asked me that question when Olivia’s was born I would have happily gone along with it. I needed comfort, oversized and no fuss. However the reality was slummy mummy I was not, even if after an hour of getting ready I was covered in baby sick, breast milk and toddler wee. For me, the pyjama trend stayed locked in the pages of vogue and the fashionistas of instagram. Fast forward six months and the pyjama trend is still threatening to invade my day/evening wardrobe. Ignore it no more, the trend has hit the mainstream and it’s time to address it. So how does one consider wearing your best nightie without looking silly? Here are the rules..
To avoid the ‘mooching around the house look’, top knots, hair rollers or slippers are a “no no” as that would look silly right?! Accessories and lots of them. You want to dress up your bed wear, so embellish them with a chunky or long line necklace and some arm candy too. The bag..it all depends on where you are taking your PJ’s out too. I would suggest a clutch or a shoulder bag. A cross body if your going for a slightly more casual day look. Shoes. Slippers are a noooo! even if they are Charlotte Olympia or Uggs, keep them at home. You need something with a heel, strappy, show off abit of ankle or toe. Whatever works. Make up. Au naturel will not do. You need to look like your ready for a night out. That means make an appointment with your lash technician and get baby Daddy to look after the kids. Your war paint needs to applied with thought and precision. Lace. I would recommend keeping any lacey nightwear for the bedroom or an Ann Summers party. This trend needs to be embraced with dignity, style and grace so make sure your covered up. That goes for anything see-through. Satin. Yes yes yes but only in a shirt and trouser PJ coords scenario or a PJ shirt teamed up with a pair of jeans. The eye mask. Hmmmm depends on you’re nightout. I would keep it at home, or consider it as a trendy headband…actually I take that back. Leave it at home. The pyjama coords. Yes this trend is allowing you to wear your full pyjama set. If the thought brings you out in a cold sweat, why not team your PJ top with a pair of jeans and heels. Lastly, leave any characterised Pyjamas sets at home. There is a time and a place for Mickey Mouse. So now we have all the logistics out of the way, here are my top five Jim Jams that are worth leaving the bedroom for. Please note, they can be worn as coords or separates. 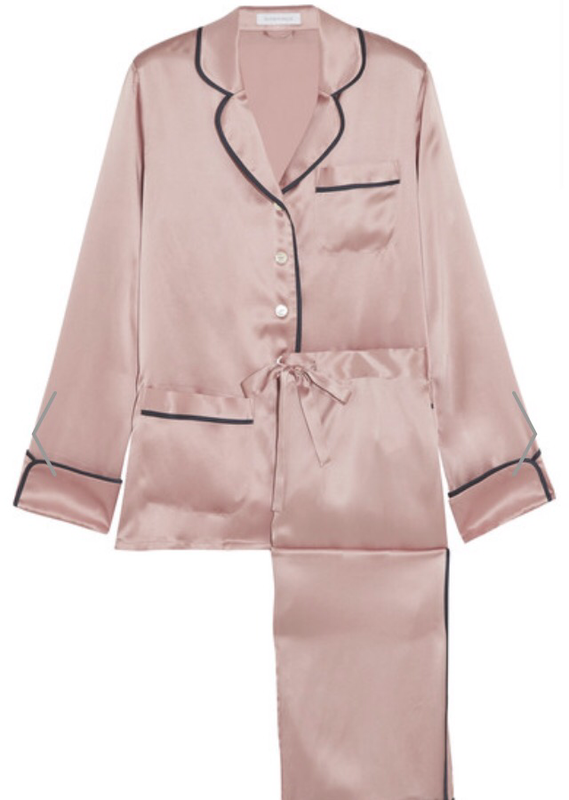 Marks and Spencer; Rosie for Autograph-Pure Silk Revere Collar Pyjama set. Olivia Von Halle for Net a Porter; Coco silk pyjama set. Sleepy Jones for Net a Porter; Marina printed silk charmeuse pyjama set. 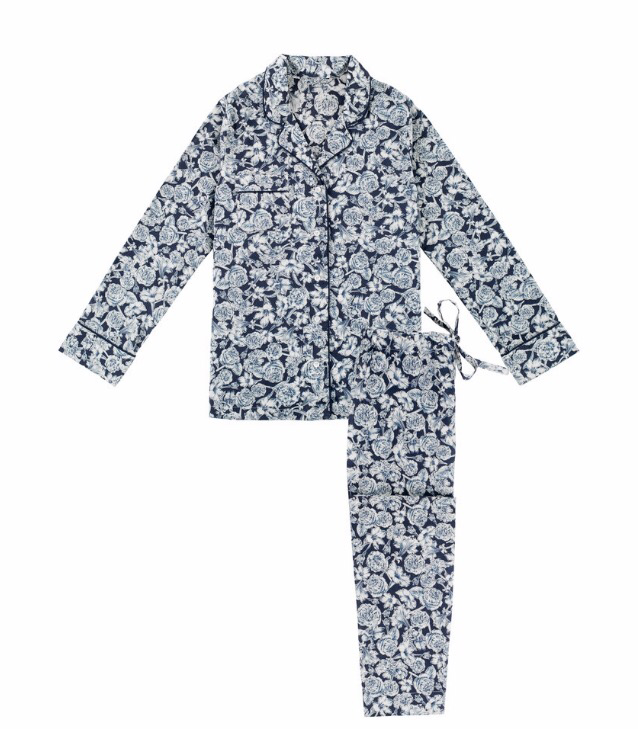 The Reach; Women’s Liberty Blue Floral Print Pyjama set.